On the evening of Sept 28, Open Garden co-founder and CEO Micha Benoliel was on Skype call in a hotel room in Hong Kong complaining to his CMO Christophe Daligault that their new app FireChat wasn’t getting any traction in Hong Kong. Benoliel wasn’t there on business or vacation. He was on his way back home to San Francisco from a conference in India, and he was forced into an overnight layover in Hong Kong. Shortly after he hung up with Daligault though, he saw something that made him change his plans. Downloads of FireChat started skyrocketing in Hong Kong before his eyes, jumping from a few hundred to 100,000 Android and iOS installs in a single evening. What happened? Occupy Central protesters, fearing a government shutdown of cellular networks or blockage of social media apps, began turning to FireChat as a means of bypassing the internet. One of the key features of the messaging app is its ability to create direct peer-to-peer links between nearby phones using Bluetooth and Wi-Fi. Protesters could use FireChat to communicate and coordinate even if mobile networks got congested or went down completely, and the next few days were a whirlwind for Open Garden. FireChat had already become an underground success in tech circles, but overnight it gained international prominence. Benoliel was all over cable TV news and the media heralded FireChat as the newest tool for dissident movements facing repressive government regimes. The odd thing is that [company]Open Garden[/company] never thought it would find itself in this kind of situation. When the startup launched at TechCrunch Disrupt 2012 it never intended to become a tool of political revolution. It was just looking for a way to get people to share their internet access. Benoliel comes from a telecom background, having worked with Skype to launch Skype In and Skype Out as a means to connect to traditional telephone networks while Stanislav Shalunov and Greg Hazel came over form BitTorrent. While working at academic network consortium Internet2, Shalunov created LEDBAT, an algorithm used heavily today to manage congestion on the internet. Hazel led development of the popular BitTorrent file-sharing client µTorrent. Open Garden started as a conversation in a San Francisco Thai restaurant between Benoliel and Shalunov about the proliferation of smartphones and what it would mean for the future of networking if everyone toted about a connected computing device in their pockets and purses. Smartphones have always been considered endpoints of the internet, where traffic began and terminated, but they haven’t been thought of as way stations within the network itself. Shalunov and Benoliel wanted to change that by making smartphones and other mobile devices nodes within the network capable of connecting to each other and passing along traffic. Open Garden was born shortly afterwards in 2011. 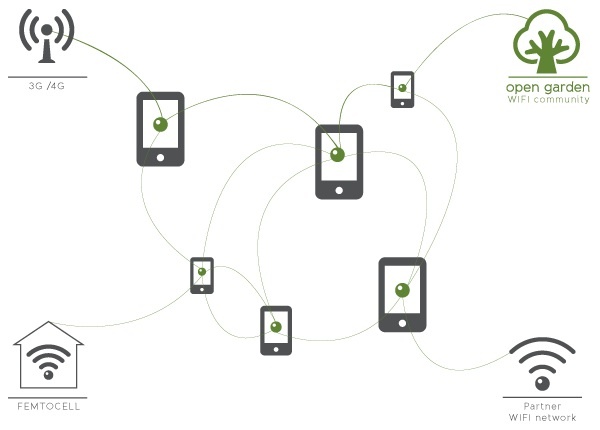 Open Garden’s first eponymous app basically allows nearby devices to connect directly through Wi-Fi forming vast mesh networks where they can crowdsource their internet connections. Typically our devices rely on a single link provided by your mobile carrier or ISP to ferry your traffic back and forth to the internet. But Open Garden proposed to overturn that notion and build an access network of myriad links, where devices could coordinate and optimize the flow of their collective traffic over the most efficient – and often the cheapest – connection available. Basically Open Garden was pushing the idea of a broadband commons, in which everyone cooperated by sharing their bandwidth, and everyone stood to benefit. Instead of buying a mobile data plan for your tablet, you can hook into the local Open Garden network and use your neighbor’s smartphone connection. In turn, that smartphone could connect to a neighboring laptop and ride its faster, cheaper wired internet connection. There was only one problem. The Open Garden app was mainly gaining traction among a tech-savvy set. “It’s too abstract a concept for many people,” Benoliel said. Open Garden originally developed FireChat as a proof-of-concept, not intending it would become its primary application. “We saw the limits of the Open Garden app,” Benoliel said. “We launched FireChat to demonstrate the power of our technology.” If people were presented with a concrete use case that showed the advantages of linking our devices into a constantly morphing mesh network, then maybe convincing them that other applications like bandwidth sharing weren’t such a strange idea, Benoliel said. The obvious application to start with was social networking. In its global mode, FireChat looks like dozens of other chat apps, allowing people around the world to communicate in rooms over an internet connection. But FireChat could communicate directly through Wi-Fi and Bluetooth connections like Open Garden’s bandwidth sharing app, and it immediately stood out from other messaging apps. By letting its users connect their devices directly, they could not only communicate off the grid but they created a new social context for that communication. FireChat created hyperlocal networks where everyone in the same vicinity basically wound up in the same chatroom. There are other apps that follow similar hyperlocal principles ranging from Foursquare’s Swarm to Yik Yak, but none of them bring quite the same sense of communal chaos as FireChat. FireChat isn’t a virtual bulletin board or a way to coordinate with friends. It basically brings together a bunch of strangers that happen to be within Bluetooth or Wi-Fi range of one another to anonymously share their random thoughts. Of course, to make FireChat work on the hyperlocal level, you need multiple people in the same location so those ad hoc networks can form, and even if they do connect there’s no guarantee random strangers will find anything in common to talk about. So Open Garden started looking toward big events like rock festivals where it could get large group of FireChat users together as part of communal experience. In September at Burning Man, 5,000 burners came together to use FireChat as a communications and logistics tool that could overcome the spotty cellular coverage in the Nevada desert. And last month bands at India’s largest music festival NH7 began using FireChat as a means to communicate directly with the fans surrounding them at the event. But it was among protest movements that FireChat really came into its own. Just a few weeks after its launch on iOS, FireChat shot to the top the iTunes messaging app charts in Taiwan surpassing even messaging local leader Line in the rankings. The app was embraced by Taiwan’s Sunflower Movement, which was protesting new trade agreements with China. But in September the world definitely noticed FireChat after the Occupy Central movement made it a core organizational tool. Benoliel, who spent 10 days in Hong Kong observing the protests, said he believes FireChat’s phenomenal growth among the protesters was due to several reasons. First, Hong Kong not only has one of the highest density’s of smartphones in the world, it also has one of the highest population density’s in the world, making it much easier for FireChat’s hyperlocal networks to form. While the Chinese government never shut down cellular networks during the protests, there was plenty of fear that it would. And in places like Central and the Admiralty, there was such a density of protesters that cellular networks become too congested to be used reliably, Benoliel said. Finally, protesters latched onto FireChat’s anonymity. Users registered under pseudonyms and fake email addresses, and by using local mesh networking they were basically able to keep their communications below the internet’s radar. There was no way to centrally track a user or censor the app or any messages. Not even Open Garden could see these hyperlocal conversations because those communications never hit its servers. The messages would proliferate directly from phone to phone and then just disappear. FireChat, however, isn’t a secure communications tool. It’s designed to show all messages to anyone who happens to be in range to see them, which makes it great for open social networking. But it also means that it’s just as easy for a government agent as it is for a protest organizer to see or participate in a conversation as long they’re part of the same ad hoc network. During the weeks of the Hong Kong protests, Open Garden’s developers started adding new features like verified IDs, which allowed trusted voices like journalists to sacrifice their anonymity to deliver more reliable information. The startup’s devs also began tackling the more difficult task of building encrypted direct messaging channels in the app, which can still be used over local peer-to-peer connections. “I slept 12 hours that week, and I got more sleep than our developers,” CMO Daligault said. Open Garden wasn’t just experimenting with social networking anymore. It was actively trying to optimize its app so it could be used as a protest and political organization tool. Open Garden is in a rather odd place. It was founded as a startup trying to change the way we think of internet access, but today it finds itself a social messaging company. Benoliel readily admits the focus of Open Garden is now squarely on FireChat. The company is trying to find more contexts for which its app will be useful behind protests and public festivals, so it can grow its user base (Open Garden isn’t releasing any specific numbers on FireChat subscribers though it said it has now seen 8 million downloads of all of its apps). Open Garden will put its bandwidth sharing apps on the backburner, but it’s not abandoning them. In fact, the bandwidth-sharing app and FireChat have a lot more in common than you might think. Ultimately Open Garden is company trying change the architecture of the internet by turning the billions of devices that connect to its fringes more than just endpoints, CTO Shalunov said. Bandwidth sharing and off-grid messaging are just two examples of applications that can make good use of that architecture. Open Garden’s mistake, Shalunov said, is that it started with the wrong application. Open Garden plans to build more apps on its mesh technology, and in fact, its business model depends on it. It makes no revenues from any of its apps today, but in the future it plans to sell access to its APIs to developers. It’s already laid the groundwork for this with a small company called TrackR, which builds Bluetooth tags that let you keep tabs on your valuables. TrackR is using Open Garden’s growing FireChat network to scan for lost items, effectively putting millions of smartphones to work monitoring its tags in the internet of things. Eventually Open Garden wants to license its technologies to mobile carriers and ISPs. That idea might sound a little far-fetched since it would require competing operators to share their bandwidth with one another. That’s a hard concept for an operator to wrap its mind around, said Don Hutchison, former GM of cable broadband company Excite@Home and one of Open Garden’s seed investors, but Hutchison said Open Garden convinced him that ISPs and carriers will eventually start looking at such shared networking models. It’s just a more efficient way to use a finite broadband resource and deliver connectivity to the masses, Hutchison said. “If it’s going to happen at all, it’s going to be a third party like Open Garden that will engender it,” he said. Open Garden has a lot of potential, but there is no proverbial low-hanging fruit for this company. If it wants to sell access to its network, it needs to build that network to a grand scale. You can’t sell hyperconnectivity and hyperlocation if there aren’t enough users to actually form a network at any given place. And the carriers, well, they’re carriers. Their networks are their most valuable assets. Sharing them just isn’t in their DNA. Even Hutchison admits it will be tough to convince them Open Garden’s technology is in their best interests. But apart from the operators, Open Garden also will have to convince consumers to share their devices’ radios and internet connections. We’ve come to think of our home and mobile connections as our own private driveways onto the internet, but for Open Garden’s model to work we’ll have to think of our devices as part of larger network. Our neighbors will have just as much right to access our radios — if not our actual data plans — as we will. That’s going to be a hard sell. But Shalunov thinks that’s a cultural hurdle society will eventually overcome once the benefits of forming these grand meshes are fully explained. People who use FireChat, for the most part, understand that their devices are all creating a communal communications network and that they’re better able to chat because of it. It’s not that much further of a leap to get people to accept the idea of sharing their actual internet connections, Shalunov said. Next step, get US carriers to remove the artificial barrier to tethering. The idea that the bandwidth I pay for each month is mine, to do with as I see fit, has to be overcome before this idea of being part of the mesh gains traction here. Unfortunately.